RViz is not just a visualizer application, it is also a library! Much of RViz’s functionality can be accessed within your own application by linking against librviz.so (or whatever your OS likes to call it). This tutorial shows a very simple example of creating a 3D visualizer widget (rviz::RenderPanel), programmatically creating a new Grid display within it, then using Qt slider controls to adjust a couple of the grid’s properties. The app is called “myviz”. The code for myviz is in these files: src/main.cpp, src/myviz.h, and src/myviz.cpp. The main() for this “myviz” example is very simple, it just initializes ROS, creates a QApplication, creates the top-level widget (of type “MyViz”), shows it, and runs the Qt event loop. 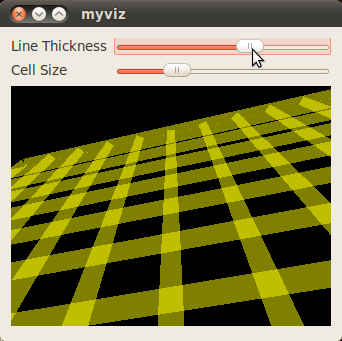 Class “MyViz” implements the top level widget for this example. Constructor for MyViz. This does most of the work of the class. Construct and lay out labels and slider controls. Construct and lay out render panel. Set the top-level layout for this MyViz widget. Next we initialize the main RViz classes. The VisualizationManager is the container for Display objects, holds the main Ogre scene, holds the ViewController, etc. It is very central and we will probably need one in every usage of librviz. Configure the GridDisplay the way we like it. This function is a Qt slot connected to a QSlider’s valueChanged() signal. It sets the line thickness of the grid by changing the grid’s “Line Width” property. This function is a Qt slot connected to a QSlider’s valueChanged() signal. It sets the cell size of the grid by changing the grid’s “Cell Size” Property.